Earlier this year, Duff a book full of advice and tips on life called How to Be a Man (and Other Illusions). It seemed to be released a bit under the radar but it has gotten good reviews so I’m sure I’ll check it out at some point. To coincide with the release of the book, McKagan also put together a collection of three songs and released them digitally on the same day that the book was released. Obviously, Duff McKagan is a rock legend having been an original member of Guns N’ Roses as well as Velvet Revolver. He also fronts his own band called Loaded and released a solo album back in 1993 that I’ve always loved. So while I knew of the book’s existence, surprisingly it’s only recently that I discovered new music from Duff existed when I was browsing through Amazon’s Prime Music service. 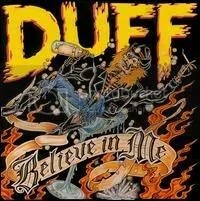 I can hardly find any info about this EP other than what Duff has said in interviews. What I do know is that Duff wasn’t stunt-casting musicians for the album as the people who played here are legitimate friends. Regrettably, despite assembling members of Alice In Chains, Stone Sour and Guns N’ Roses together, How to Be a Man is simply adequate. “How to Be a Man” is an acoustic rocker that has that Alice In Chains vibe and sounds fitting for radio. “Punker” is what you’d imagine — a punk song. It’s “Kill the Internet” that I find most interesting. It’s got a killer (no pun intended) riff. Duff rails against social media, online privacy, ISIS, the Kardashians, etc. in this sound which kinda puts him into grumpy old man category, but the music itself is really good.